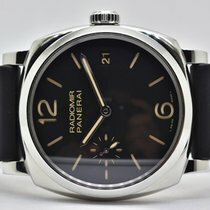 An excellent condition pre-owned stainless steel 47mm case size manual wind 'Q' series Panerai Radiomir 1940 3 Days (PAM00514) featuring a black sandwich dial with Arabic numerals at 6 & 12 housing a seconds sub-dial at 9 O'clock and a date aperture at 3 O'clock surrounded by a polished finish domed bezel on a tan leather pin buckle Panerai strap. This particular watch features a Sapphire crystal exhibition case back showing off the caliber P.3000 manual wind movement, which has a power reserve of 72 hours. 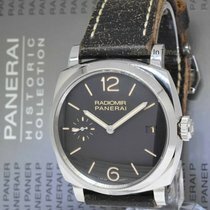 The watch comes complete with its original Panerai box, case protector and all relevant paperwork being originally supplied as new on 1st May 2016.